Sorry about the pics peeps, we had visitors on Saturday and I didn't get anything done. Sunday was a little more productive and I managed to pretty much finish inside the case. It was slow going, though, and I managed to take some pics. I still have to install the HDDs and connect them, but to save complications/issues, I'll leave that until I've loaded Windows on the M.2 SSD. There's some cabling to do, but I'm going to leave that which was already there to save time. This build has taken more than long enough already and I just want to get it booted. The inner workings. 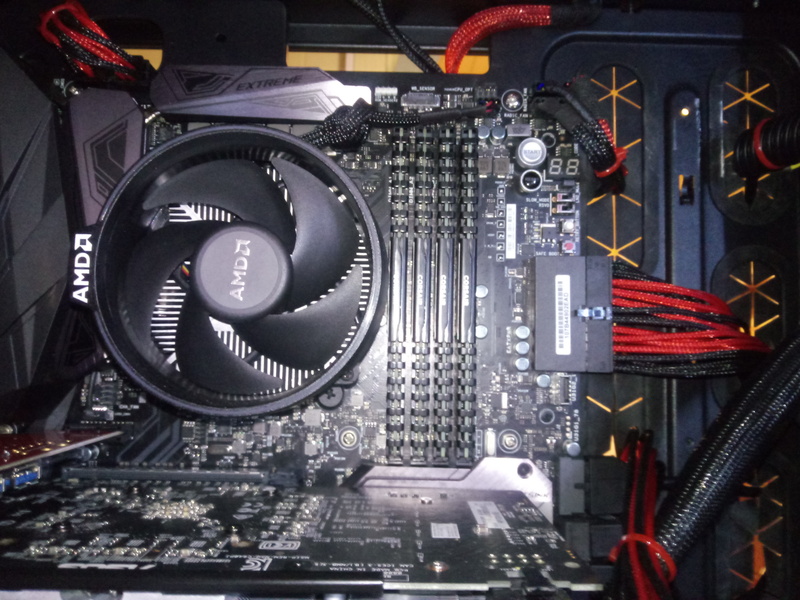 As you will see, the ATX power connector is flat and facing right. I've not seen this before, but why not? It is a great idea and makes cabling easier and tidier. Another plus with this board is there are two 20 pin USB 3.1 gen 1 ports, one a centre board on the right, and the other at bottom centre. There is also a USB 3.1 gen 2 front panel connector at centre board on the right, so there's no shortage of high speed data transfer abilities. The two thicker looking cables at centre case are actually bundles of 6 and 4 SATA cables respectively. I just thought it better to encase them in that stretchy stuff than having 10 loose SATA cables with a couple of ties here and there. 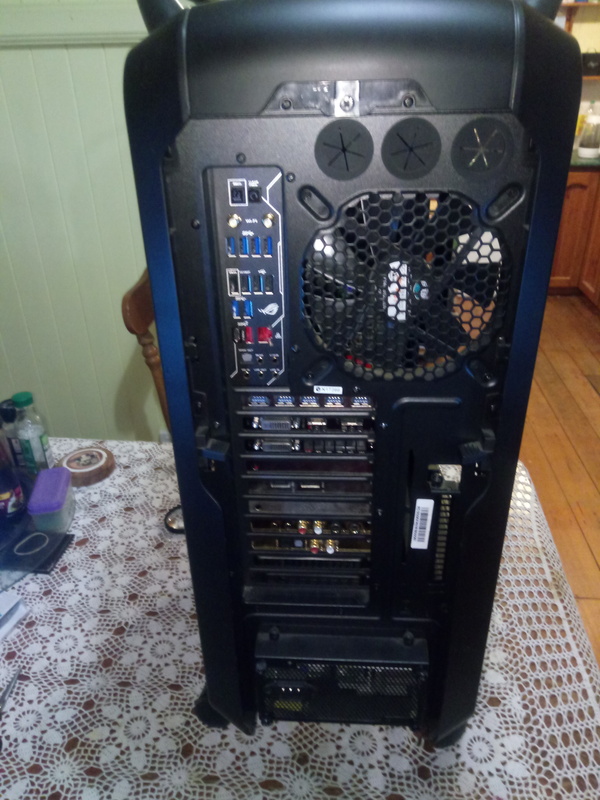 A new shot of the rear showing the IO back panel, which now has the plate built into the motherboard and not fixed to the chassis, which is generally the case with most boards I've seen. 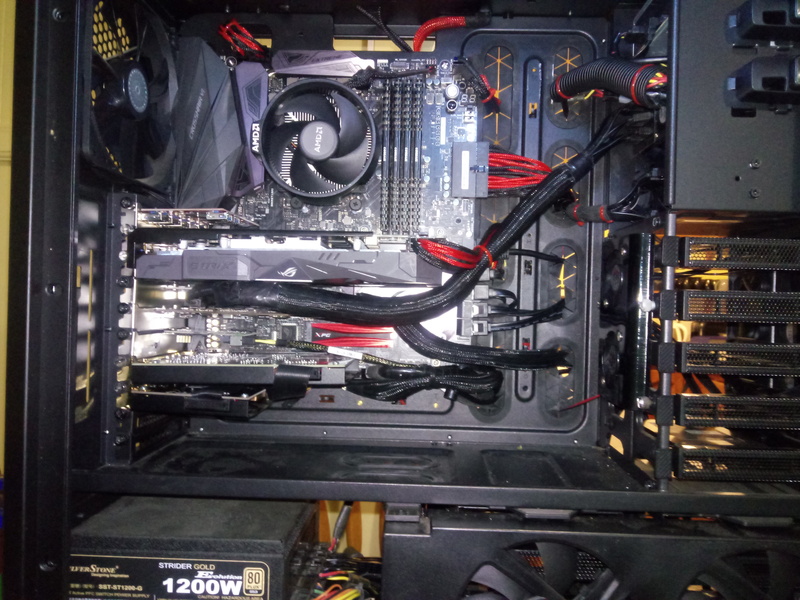 Some of the inner case cabling was in place already, but I see where some of it could be improved so I may yet make some changes.... will provide pics of any alterations. Still having no luck with this machine. It posts but is not seeing the M.2 SSDs and won't allow me into the BIOS settings to make necessary adjustments. I'm doing everything I'm supposed to but none of the given options allow me access to the BIOS to make the M.2s visible, etc. It's 9.31 PM here right now, and I'm tired as, but I'll visit the ASUS site in the morning to seek answers, though if anyone has any useful ideas I'd be most appreciative to hear them. I found the solution to the BIOS entry issue and have made the necessary adjustments. Windows is now loaded and I am in the process of installing my programs, etc. Then I have to go through the HDDs to ascertain which ones will go into the case. One of them appears to be faulty and shorts everything out, so I will test them for faults on my HP 2-in-1 and hope that I isolate the bad one before replacing them one at a time into the 'Beast'. It has been a long time in the making but it's finally up and running. And boy, is it fast! It took only 15 - 20 minutes to load Windows. I haven't had much play time with it as yet, but everything is looking good.